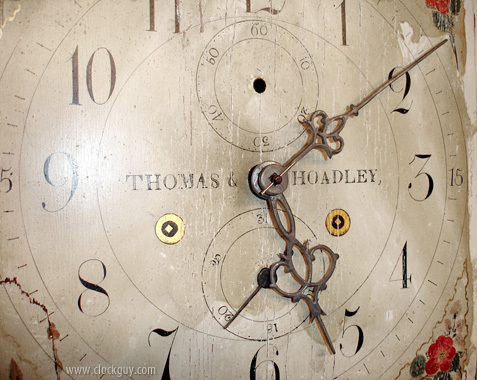 Seth Thomas Clock Company History - Antique Clocks Guy: We bring antique clocks collectors and buyers together. Always the highest quality antique clocks available. 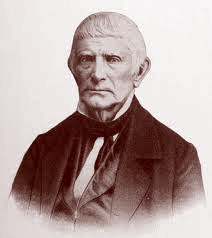 Seth Thomas was born in Wolcott, Connecticut in 1785, the fifth of seven children of Scottish immigrant, James Thomas, a cooper, and his wife Maria Ward. Connecticut, incidentally, was an important and expanding hub in the American clockmaking trade. 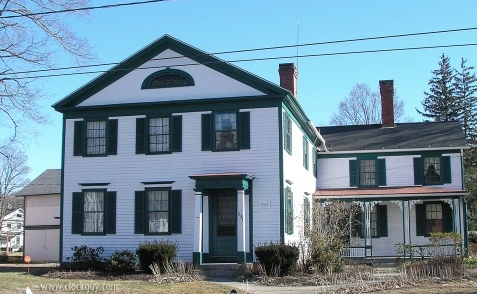 He was born in this house and lived there until about 1810. Seth had a natural ability for carpentry and he probably obtained his knowledge and interest in mill property and manufacturing from this. He had imited formal education and left school at an early age to become an apprentice carpenter and joiner to Daniel Tuttle, of Plymouth. Seth was apparently a man of few words with great energy and perseverance in all that he did; thus, he paid strong attention to the duties of this apprenticeship. 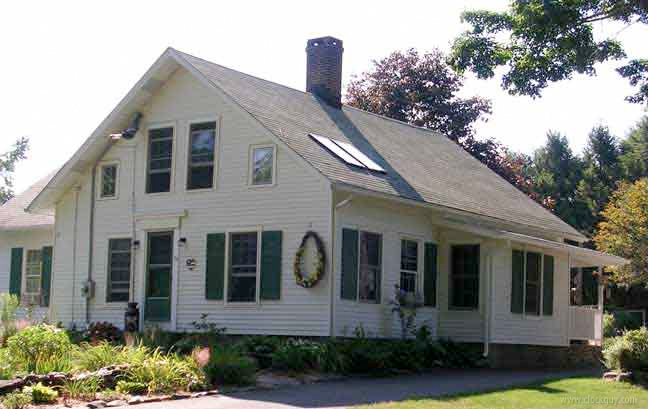 Subsequently, he became a skilled woodworker and built houses and barns in the nearby towns around Farmingbury/Wolcott (incorporated 1796). 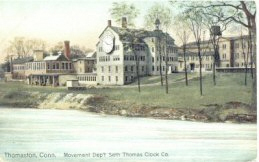 In the early 1800s, Seth attempted to set up a clock-making industry in Wolcott. He made his first clock in his family's house. 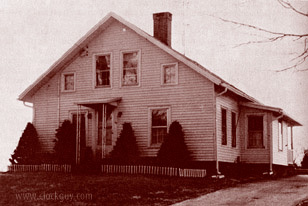 The woods around the house were filled with mountain laurel trees; many Wolcott men worked cutting the trees and sawing them into thin slices, which, when seasoned, were used for the wooden wheels of the clocks. The women of the town spun flax (cotton) into cords and these were used to hold the clock weights. 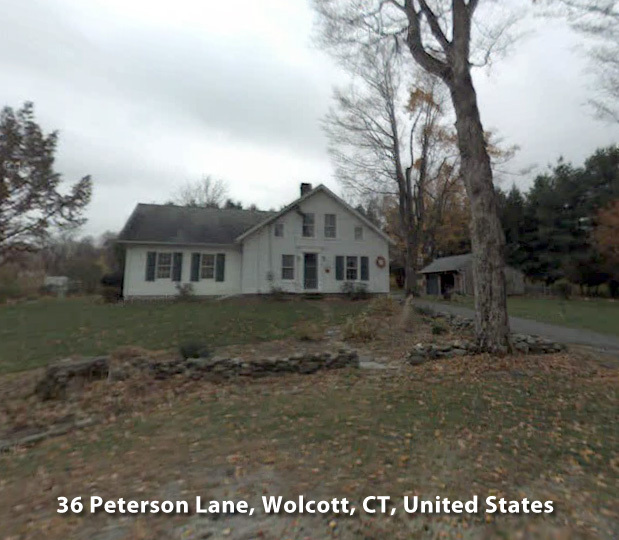 As a result, the town of Wolcott profited to some extent from the Thomas enterprise, the short time it was located in Wolcott. In 1807, Seth moved to Plymouth. There he joined Eli Terry and Silas Hoadley in a business of making clocks at a wholesale rate. Seth mainly worked on fitting the wheels and different clock parts together. From 1807 until 1810, they made 4000 clocks of the "hang-up" or "wag-on-the wall" type. These clocks did not have cases, but buyers who wanted cases for their clocks hired carpenters to build what they called "grandfather cases" for them. 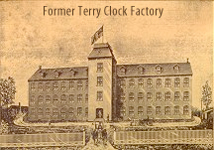 In 1810, Thomas and Hoadley, for $6,000, bought out Terry's share of the company, by then the most successful clockmaking firm in the country, and worked together until 1812. 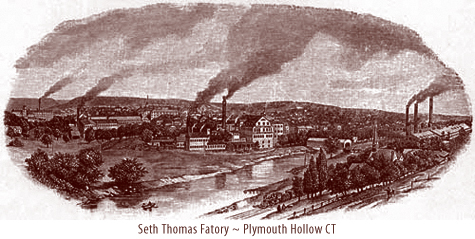 On December 4, 1813, Seth Thomas sold out his share of the company to Hoadley for $2,000, and went into business on his own in Plymouth Hollow on land he purchased from a former apprentice of Eli Terry. The land included a clock factory and was conveniently located near Eli Terry's new shop (where was the non-compete agreement?). Thomas continued Clark’s wooden movement tall clock production, and about 1817 began making the wooden movement shelf clock. These were cased in pillar and scroll cases until 1830, when the bronze looking glass and other styles became popular. In 1842, brass movements were introduced, and first cased in the popular O.G. case (which was made until 1913). 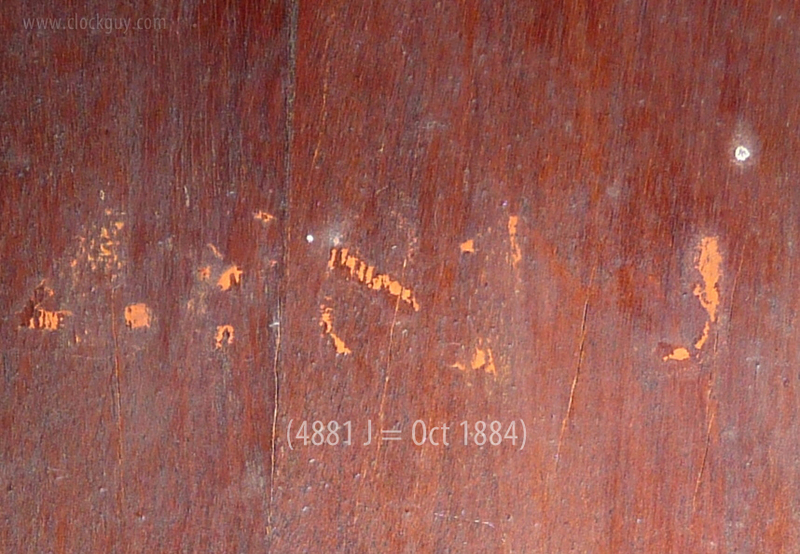 Wood movements were phased out in 1845. 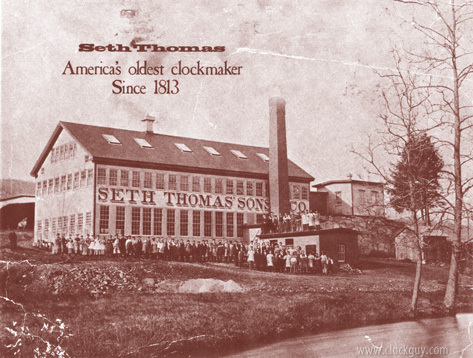 The Seth Thomas Clock Company was organized as a joint stock corporation on May 3, 1853 to succeed the earlier clockmaking operation of the founder. 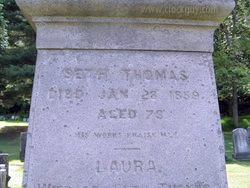 Seth Thomas (1785-1859) had been manufacturing clocks at the site since 1814. Seth's first wife was Philinda Tuttle; they married in the early 1800s and had a daughter, Philinda. His second wife was Laura A. Andrews. 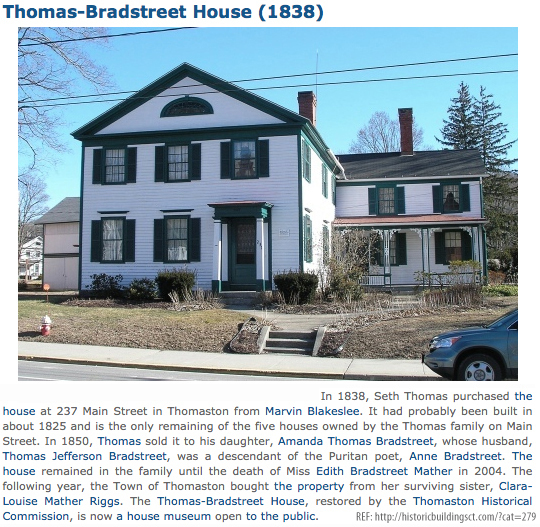 They had six children Seth, Martha, Amanda, Edward, Elizabeth, and Aaron. Seth Jr. and Aaron went into the clock business with their father, subsequently enlarging the clock factory and developing it into a worldwide business. 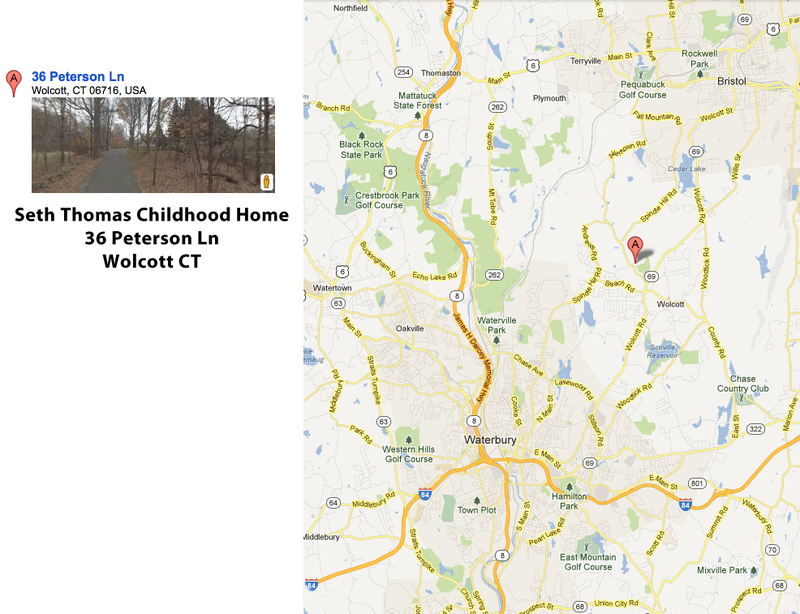 After Thomas’ death in 1859, the town of Plymouth CT was renamed "Thomaston" in his honor. At that time, Aaron became President and began to add new products. About 1862, the firm purchased the patent rights of Wait T. Huntington and Harvey Platts of Ithaca, New York and added three models to their line that year. The earliest of the clocks indicate only three patent dates on the dials, September 19, 1854, November 17, 1857 and January 31, 1860. The fourth and final patent of March 1, 1862 is carried on most of their calendar clocks manufactured until 1875 or 1876. On February 15, 1876 Randall T. Andrews, Jr., a Thomas relative and workman in the factory, received a patent on an improved mechanism. This was put into production and utilized on all later perpetual calendar clocks until the last model was dropped in 1917. 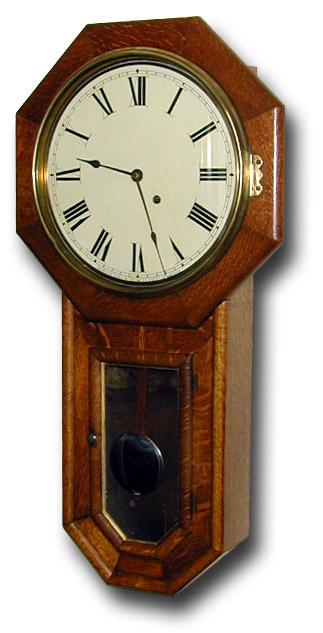 Regulator clocks were introduced in 1860. The patterns and machinery for these had been purchased in 1859 from the creditors of bankrupt clockmaker Silas B. Terry. 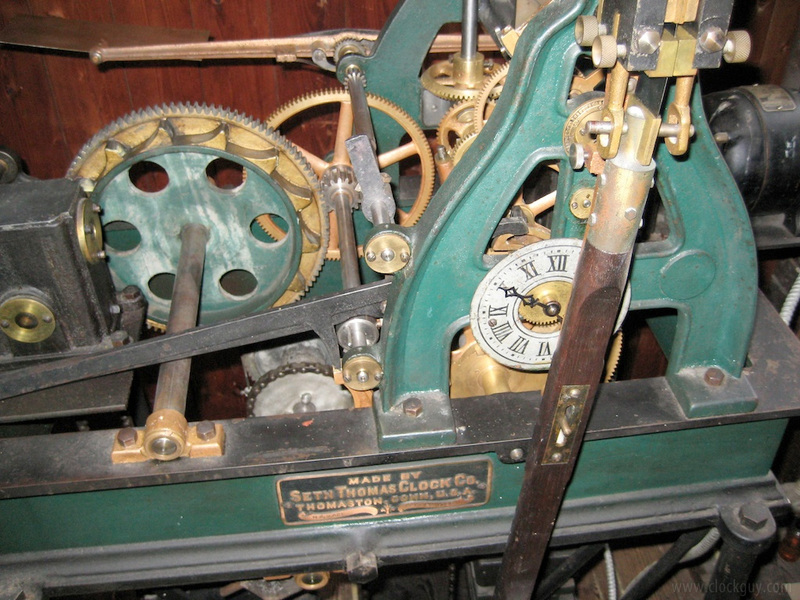 Spring driven clocks were introduced ca. 1855–1860. Perpetual calendar clocks were made from ca. 1863–1917. Some of the most popular later types include walnut kitchen clocks, made from 1884–1909; marble clocks, 1887–ca. 1895; black (Adamantine finish) wood mantel clocks, ca. 1885–1917; black enameled iron cased clocks, 1892–ca. 1895; oak kitchen clocks, 1890–ca. 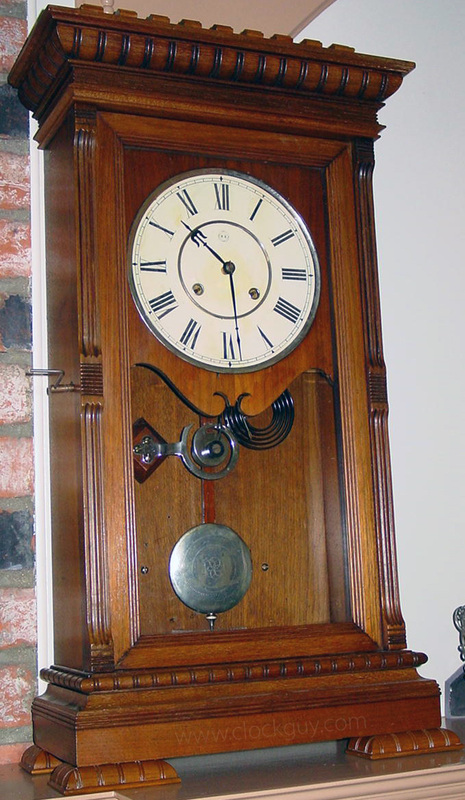 1915; tambour clocks, introduced in 1904; chime clocks, introduced in 1909; and electric A/C clocks, introduced in 1928. 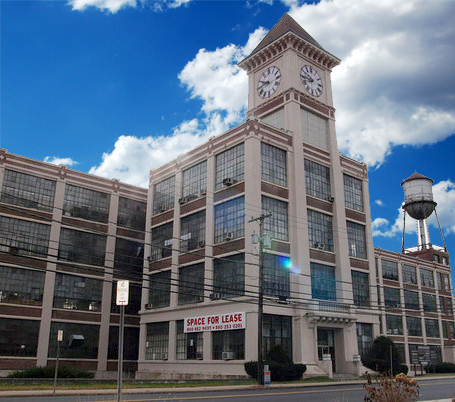 The Seth Thomas Clock Company was very prosperous into the 20th Century and was considered the “Tiffany’s” of Connecticut clock manufacture, even by their competitors. 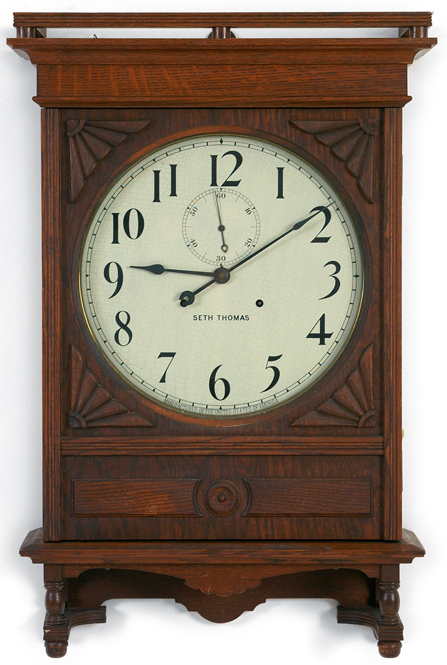 Between 1865 and 1879 they operated a subsidiary firm known as Seth Thomas' Sons & Company that manufactured a higher-grade 15-day mantel clock movement and during that period were major supporters of a New York sales outlet known as the American Clock Company. They also became a major manufacturer of tower and street clocks after 1872 and in between 1915 were manufacturers of jeweled watches. “That our business has throughout half a century steadily increased from a small beginning to its present dimensions, is sufficient evidence of the quality of our work. No pains will be spared to maintain and increase the reputation of the 'SETH THOMAS CLOCKS' and we give our warrant to the full amount of the cost, that every clock that leaves our factory, if properly used, will prove a good Time Keeper." 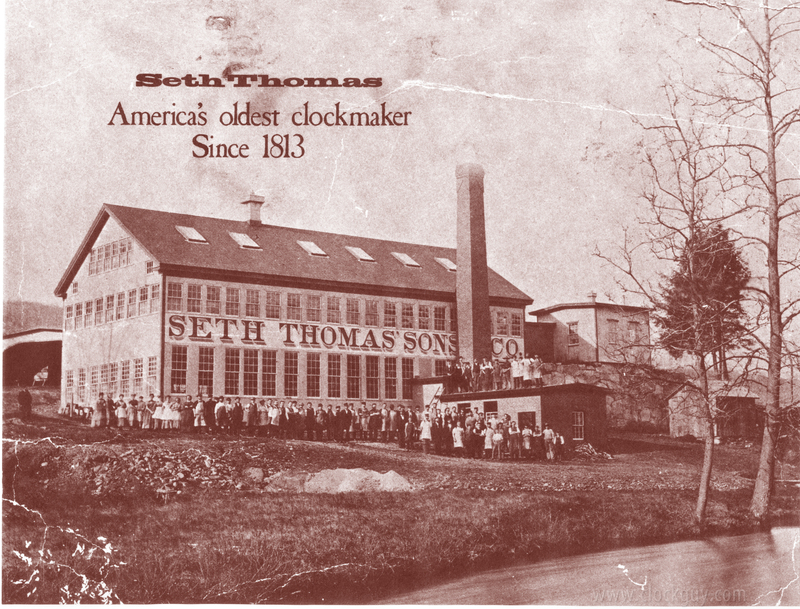 Many Seth Thomas clocks from 1881 to 1918 have a date code stamped in ink on the case back or bottom. Usually, the year is done in reverse, followed by a letter A–L representing the month. For example, April 1897 would appear as 7981 D.
On January 1, 1931, the firm became a subsidiary of General Time Instruments Corporation and soon passed from family control. 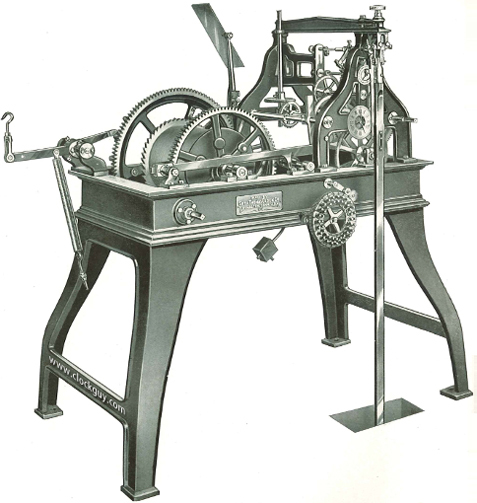 Seth Thomas Tower Clock Mechanism from 1911 catalogue. The firm's decline was gradual over the next 50 years and culminated by purchase of Seth Thomas by Talley Industries in 1968 and moving from Connecticut to Norcross, Georgia somewhere between 1975-1979. It was reported in 1988 that the firm was all but dissolved. In June 2001 General Time announced that it was closing its entire operation. The Colibri Group acquired Seth Thomas. The NAWCC (the National Association of Watch and Clock collectors) purchased from Seth Thomas their collection of historical records, drawings, photographs, advertisements and documents. In 2003, The Clock Guy was contacted at that time by a staff member at General Time regarding disposition of their collection which was subsequently sold to private collectors. In January, 2009, The Colibri Group unexpectedly shut its doors, laying off its 280 employees and preparing to sell all remaining jewelry, gold and silver to pay creditors. The following message appeared on the Colibri website: "February 16, 2009: The Colibri Group is currently in receivership and is not accepting any orders at this time. We are also unable to repair or replace any items returned to us for the time being. We will do our best to ensure that items that have been sent to us will be returned to the respective customer or owner. We will update this message as new information becomes available. We are sorry for the inconvenience. Thank you for your patience."